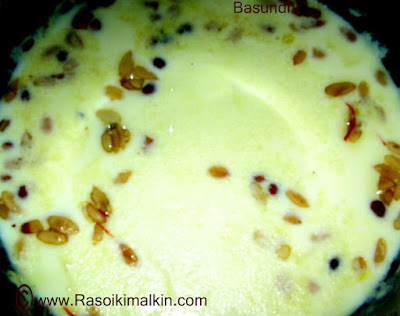 WISH ALL OF MY FRIENDS A VERY HAPPY DIVALI..
Basundhi ,is a famous chilled flavoured milk recipe liked by most of the people..it requires patience and take more time..But i did it in microwave and it lasted me just less than half an hour..Mothers can make this recipe sweet chilled milk and let their children have it without making fuss..
Place half spoon of ghee in a microsafe bowl and micro high for 30 seconds.Remove it outside and add the dry nuts/fruits as per your choice and micro high for 1 minute.Keep them aside. 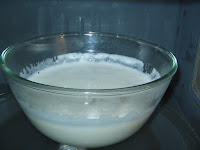 Boil milk(micro in 360 degrees) in a microsafe bowl for 20 minutes,stir for every 3 to 4 minutes..I prefer to boil in low heat, to avoid milk not to spill ..By this time the milk will be boiled and reduced a little .Remove it outside,and add khova/condensed milk,sugar,saffron,and dry nuts and elaichi powder. 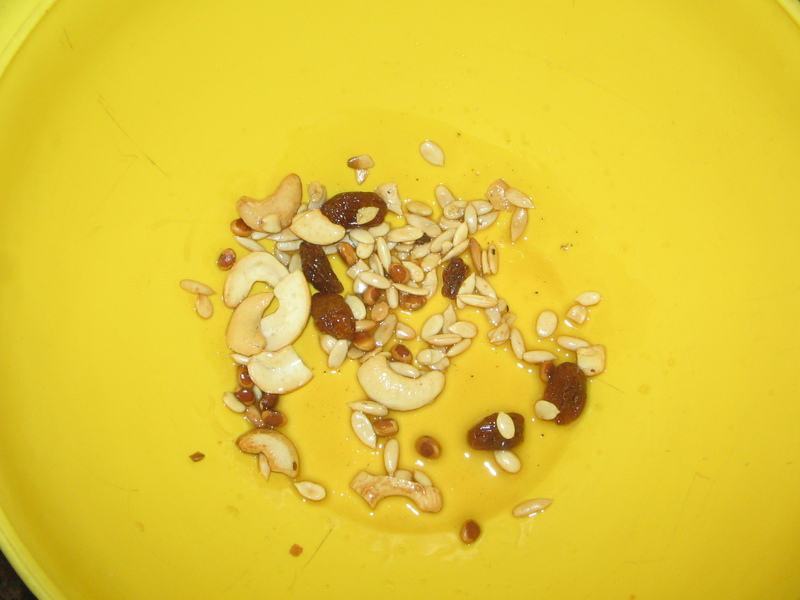 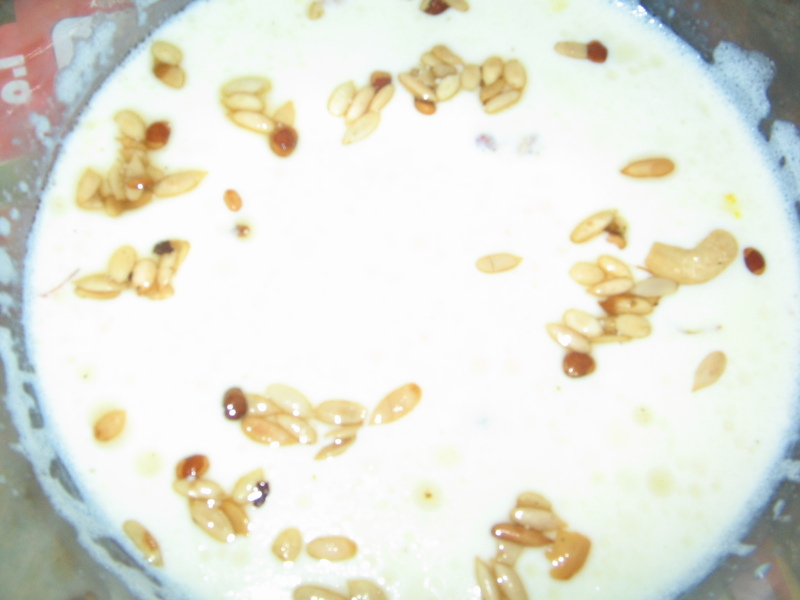 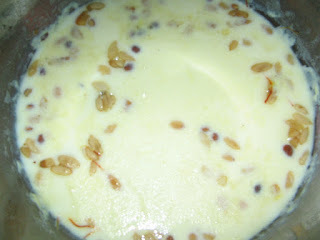 Thats all,remove from oven and mix well .Let it cool.After it is cool,place the milk in a refrigerator and freeze it for atleast 3 to 4 hours and serve..
A tasty chilled and flavoured milk with light colour of saffron will be ready with dry nuts to drink.Both elders and Children like it a lot..tasty and yummy..
Wishing u a happy and prosperous diwali...Wat a awesome basundi. Wishing u and ur family a safe,happy and prosperous diwali dear..
Wishing u a happy and prosperous diwali...Delicious basundi.